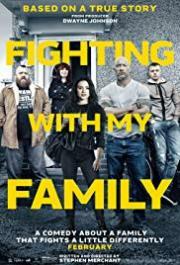 It’s corny, cliched, and advertises the WWE too much, but it ends up a satisfying and emotional watch thanks to Merchant’s writing talent and the incredibly game cast, especially Pugh. It's a pretty by-the-numbers rags-to-riches story athletic story, but has enough structure and quality moments to register as worthwhile. What they do with Zak's character is actually the glue of the movie, not so much Paige. Like with every Hollwyood portrayal of sports though, incredibly unrealistic to the real thing, and regarding the true story it's basically as true as fake news. This was a great movie! The people portrayed feel believable and very human, and Stephan Merchant proves again why he’s a comedic force to be reckoned with. The comedy is hilarious and the serious scenes are quite serious. I recently moved away from my family before watching this so that may have added to the experience as well and it made Page a relatable person in those reguards. I don’t watch wrestling, but luckily, you don’t have to to enjoy this movie. Charming characters and writing. More entertaining than expected due to the believable and likeable family members. A feel good movie that avoids being too cliched. Based on a true story, fun, entertaining and emotional., with authentic performances. Florence Pugh and Jack Lowden are siblings from a family of small time wrestlers in England. When their dad (Nick Frost) submits a tape of them to the WWE, they get an audition with WWE coach Vince Vaughn. Pugh is accepted, Lowden is not. This is a completely formulaic movie executed about as well as one can reasonably expect. There are no surprises. It makes up for this by being a good natured movie with really good performances. The characters reminded me a bit of Skins. Always enjoy seeing The Rock; he seems a bit shoehorned in, but gives it a good effort. Vince Vaughn had some nice zingers. I'd never heard of Florence Pugh before and she did a good job. Unconventional twist on a typical sports story. Would have appreciated more development between Paige committing herself and ending up on stage. I don't watch WWE so maybe it's a typical arc to throw a newcomer in? Rooting for Zack. Fav scene: "did someone dump you?" Better than I expected. I was prepared for the cliched, truth-exaggerated sports story. I was not prepared for how harrowing it would be. Zak’s parallel story of being trapped in a poverty-ridden existence with no acknowledgement or opportunity adds weight to the proceedings. His realization and acceptance are nearly triumphant as Paige’s title match. This rises above its subject matter which, however, remains both fixed AND false. But the same can be said for many movies, e.g. horror, Fast & Furious etc. It's like a stage play with its actors vying for fame and fortune--albeit with a....more easily entertained audience. Somehow manages to be faker than actual wrestling. Not only does it get a lot of things wrong about Paige (She was not rendered speechless in her WWE debut, she wasn't poorly received when she debuted in NXT, etc) it also gives her way too much credit for her presence in the "women's revolution" which was already a thing in Japan and TNA. Paige actually had an interesting life but the film opts to make a trite, overly safe dramatization rather than something at all enjoyable. A shame really. A pretty cute little family drama. Bringing Stephen Merchant on to helm this was a wise choice, as the witty dialogue and surprisingly strong performances elevate this above your standard WWE movie. As a fan, though, there are some weird inaccuracies and an annoying pro-WWE slant that makes this feel like propaganda a lot of the time. Fairly enjoyable though. Not buying Florence Pugh as an underdog for a second. She is powerful.